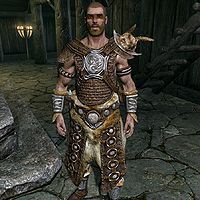 Helvard, a Nord warrior, is the housecarl of Jarl Siddgeir of Falkreath. He is a target of a Dark Brotherhood contract. He wears a set of scaled horn armor, including matching pairs of bracers and boots. He carries a steel mace of Cold as well as the key to the Jarl's Longhouse and a few common items and gold. Should you approach him, Helvard will briefly tell you about his duty as a housecarl: "I protect the Jarl, whoever that might be." He may also comment on the Falkreath cemetery: "Falkreath's cemetery reminds of us [sic] that war is not new here." He seems to be very content with his life as a housecarl: "Being Housecarl of Falkreath is an honor." He takes his job seriously though, and will often provide you with a reminder: "Treat the Jarl with respect, and you'll be welcome here." Like many other citizens, Helvard holds Nenya in high regard: "Nenya's history of service is impeccable. She truly is the Steward of Falkreath." He may also give you his opinion about the previous jarl, Dengeir of Stuhn: "Dengeir was a good Jarl in his day. Even if his day has passed." Siddgeir: "Helvard! The guards are looking sloppy today. I want you to reduce their wages for the month." Helvard: "Sir, I will shape them up but with the war on it is unwise to reduce their wages any further." OR "We can't afford to lose any men if we wish to keep Falkreath protected." Siddgeir: "I would think a man of your military training would be able to do with less but so be it." Helvard: "Preparing the defenses is almost impossible lately, every time we get a new war report our needs change." Nenya: "The trade routes are affected as well. Procuring supplies is a guessing game. Weapons sell well though." Helvard: "Mmmm, careful with that, Nenya, our merchants could be selling weapons to an invading force." "You protect the Jarl. But who protects you?" "The Dark Brotherhood has come!" If you choose to remain silent, attempting to talk to him again will have him tell you, "By the love of the Nine, what is it with you sycophants and hangers on? The jarl is busy! And so am I, for that matter." This page was last modified on 15 February 2014, at 10:59.